Wandering Tattler: Ryan Cathers Photo. The Sunday Bird Walk went to Neck Point in Nanaimo. The morning was cloudy but pleasant. The highlight of the morning was the sighting of two Wandering Tattler's and a Spotted Sandpiper along the shore at Sunset Beach. The mobbing call of the Northwestern Crows led us to a Great Horned Owl near the new walkway. We saw several flocks of Double-crested Cormorants, Pelagic Cormorants and Brandt's Cormorants moving up and down the Strait Of Georgia throughout the morning. An albino House Finch has been observed at feeders in the 3200 block of Admirals Road, off Burnside Road and East of the Island Highway in Victoria. Two Black-throated Grey Warblers were seen making their way west, from tree to tree, along Despard Avenue, near Meridian Way in Parksville. Seven Greater White-fronted Geese were seen at Buttertubs Marsh in Nanaimo. A Steller's Jay was seen at the Backyard Wildbird and Nature Store on Metral Drive in Nanaimo. 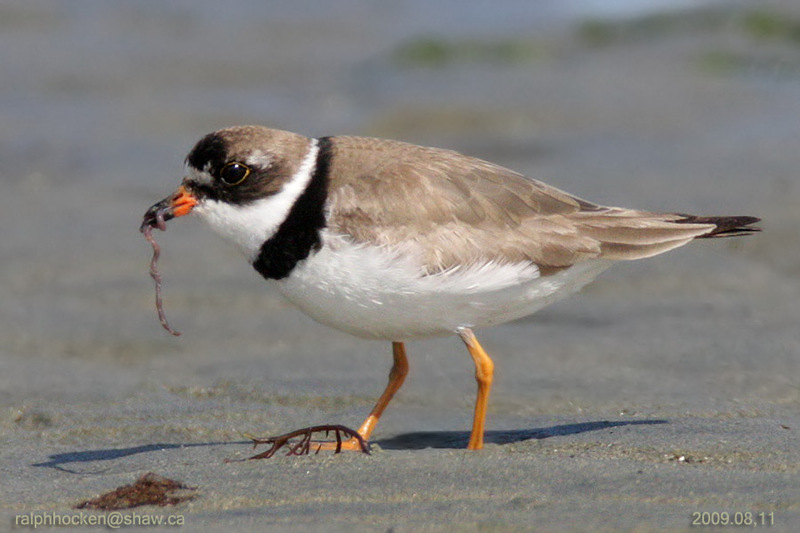 A Parasitic Jaeger was spotted chasing Bonaparte's Gulls off Piper's Lagoon in Nanaimo. Two Common Nighthawks were seen feeding over the viewing platform on the waterfront at Neck Point in Nanaimo. A Great Horned Owl was heard and then spotted in the 800 block of Flamingo Drive in Qualicum Beach. Common Nighthawks were seen over Hamilton Avenue in Nanaimo. A pair of Bullock's Oriole's were seen in a birdbath in a backyard in the 5200 block of Tom's Turnabout off Hammond Bay Road in Nanaimo. 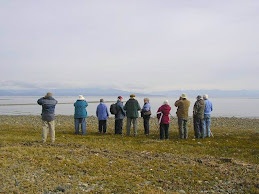 The Nanoose Naturalists meeting is on September 9th at 7 pm in the Library on Northwest Bay Road. Guest speaker--- Dr. Bill Weller's talk and slide presentation on Astronomy. Visitors and new members most welcome. The Tuesday Bird Walks will resume on September 07, 2010. The Sunday Bird Walk on September 05, 2010 will be going to Columbia Beach. We will meet at The Backyard Bird Store at 9:00 A.M. or at the parking area off Admiral Tryon Boulevard at about 9:30 A.M.
We spotted a nest on the marsh with a Pied-billed Grebe and four colorfully marked nestlings cuddling under the adult's wings near the start of the walk. A Merlin perched high up on a snag giving us great looks. A Lesser Scaup, a large number of Wood Ducks, a Hooded Merganser and a female Pintail were on the water. We heard a Greater Yellowlegs calling. We saw a Warbling Vireo and a Orange-crowned Warbler moving in the bushes. Mallard, Wood Duck, American Coot, Pied-billed Grebe, Hooded Merganser, Greater Yellowlegs, Great Blue Heron, Turkey Vulture, Merlin, Coopers Hawk, Rock Pigeon, Belted Kingfisher, Rufous Hummingbird, Northern Flicker, Barn Swallow, Common Raven, Northwestern Crow, Chestnut-backed Chickadee, Golden-crowned Kinglet, Bushtit, Orange-crowned Warbler, Warbling Vireo, Common Yellowthroat, Cedar Waxwing, American Robin, Spotted Towhee, Dark-eyed Junco, Song Sparrow, Brown-headed Cowbird, Red-winged Blackbird, Golden-crowned Sparrow, Purple Finch, American Goldfinch, House Finch, Pine Siskin and House Sparrow. 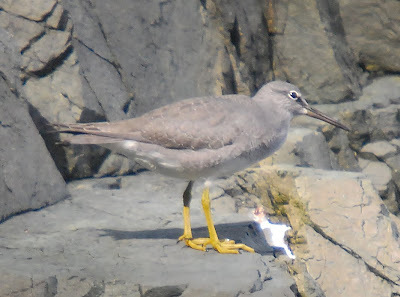 A Black-footed Albatross; Northern Fulmar; Sooty and Pink-footed Shearwaters; Fork-tailed Storm-Petrel; Common Murre; Glaucous-winged, California, Herring and Sabine's Gulls; Pelagic and Brandt's Cormorants; Pomarine Jaeger and Red-necked Phalarope were seen along Finger Bank off Ucluelet on the west side of Vancouver Island. A Black-headed Grosbeak is visiting feeders in the 1200 block of Roseanne Drive in Nanaimo. A Eurasian Collared Dove with two Band-tailed Pigeons, over forty American Goldfinch, a Downy Woodpecker, two Hairy Woodpeckers, three Pileated Woodpeckers, Pine Siskins, Spotted Towhees and House Finch are visiting feeders in the 100 block of Meridian Way in Parksville. Twelve Black-headed Grosbeaks, American Goldfinch, Chestnut-backed Chickadees, Spotted Towhees, Song Sparrows, eight Band-tailed Pigeons, Hairy Woodpeckers, Downy Woodpeckers, five Northern Flickers, Northwestern Crows, American Robins, House and Purple Finch, a Great Blue Heron and Rufous Hummingbird have been visiting a backyard in the 6900 block of Lancewood Avenue in upper Lantzville. A Pigeon Guillemot within twenty feet of shore, a Common Loon further offshore and two Western Sandpipers was seen at Port Renfrew on the west side of Vancouver Island. Two male Pine Grosbeaks, a female Blockheaded Grosbeak, eight American Goldfinch, Chestnut-backed Chickadees, Red breasted Nuthatch, Rufous-sided Towhees and a Song Sparrow are visiting feeders in a yard on Thetis Island. The Sunday Bird Walk on August 29, 2010 will be going to Neck Point in Nanaimo. We will meet at The Backyard Bird Store at 9:00 A.M. or at the parking off Hammond Bay Road at about 9:20 A.M. The Sunday Bird Walk went to Linley Valley in Nanaimo. There was a Smoky haze in the air and the winds were calm. We had some quick glances of singing Purple Martins at the start of the walk. There were Bushtits gleaning insects from a Cedar tree and a Hairy Woodpecker preening itself at the top a tall snag. Mallard, Wood Duck, Great Blue Heron, Turkey Vulture, Bald Eagle, Belted Kingfisher, Hairy Woodpecker, Downy Woodpecker, Northern Flicker, Purple Martin, Steller's Jay, Common Raven, Northwestern Crow, Chestnut-backed Chickadee, Brown Creeper, Red-breasted Nuthatch, Bushtit, Orange-crowned Warbler, Spotted Towhee, Dark-eyed Junco, Song Sparrow and Pine Siskin. There was a large flock of mixed Western and Least Sandpipers, three Semipalmated Plovers and several Killdeer on the Plummer Road side of the Englishman Estuary in Parksville. A Heermann's Gull was spotted at French Creek. A pair of Purple Martins were seen flying back and forth from MacGregor Marsh to Brookwood Marsh over Colbourne Drive in Nanaimo. A Northern Harrier, a Merlin, four Lesser Yellowlegs, a Greater Yellowlegs, forty Western and a Least Sandpiper were seen at the Nanaimo River Estuary in south Nanaimo. Forty Common Nighthawks were seen feeding high over Cedar. Western Sandpipers and Least Sandpipers, a Sharp-shinned Hawk, a Cooper's Hawk and a Merlin, Barn Swallows, Violet-green Swallows and a Cliff Swallow were seen along the Holden Creek side of the Nanaimo River Estuary in south Nanaimo. Over one hundred Killdeer, Western Sandpipers, and Least Sandpipers and a Semipalmated Plover were seen along the mudflats on the Plummer Road side of the Englishman River Estuary in Parksville. Bonaparte's Gulls, California Gull, Glaucous-winged Gulls, Pigeon Guillemot and a Marbled Murrelet were seen on the Strait of Georgia from the Plummer Road side of the Englishman River Estuary in Parksville. Twelve Common Nighthawks were seen hawking insects over Despared Avenue and Corfield Road in Parksville. The Sunday Bird Walk on August 22, 2010 will be going to Buttertubs Marsh in Nanaimo. We will meet at The Backyard Bird Store at 9:00 A.M. or at the parking area at Buttertubs Marsh off Bowen Road at about 9:20 A.M.
Barn Swallow: Ralph Hocken Photo. The Sunday Bird Walk went to Legacy Marsh in Upper Lantzville. Cooper's Hawk, California Quail, Hairy Woodpecker, Northern Flicker, Pileated Woodpecker, Willow Flycatcher, Common Raven, Steller's Jay, Violet-green Swallow, Black Swift, Chestnut-backed Chickadee, Red-breasted Nuthatch, Bewick's Wren, Swainson's Thrush, American Robin, Cedar Waxwing, Orange-crowned Warbler, Common Yellowthroat, Western Tanager, Spotted Towhee, Song Sparrow, White-crowned Sparrow, Dark-eyed Junco, Red-winged Blackbird, Brewer's Blackbird, Red Crossbill, Pine Siskin and American Goldfinch. A Hairy Woodpecker was visiting a suet feeder along Meridian Way in Parksville. Turkey Vulture, California Gull, Glaucous-winged Gull, Red-breasted Sapsucker, Northern Flicker, Willow Flycatcher, Pacific-slope Flycatcher, Warbling Vireo, Northwestern Crow, Common Raven, Violet-green Swallow, Barn Swallow, Chestnut-backed Chickadee, Red-breasted Nuthatch, Bewick's Wren, Swainson's Thrush, American Robin, European Starling, Cedar Waxwing, Orange-crowned Warbler, Common Yellowthroat, Western Tanager, Spotted Towhee, Song Sparrow, White-crowned Sparrow, Dark-eyed Junco, Red-winged Blackbird, Brewer's Blackbird, House Finch, Red Crossbill, Pine Siskin and American Goldfinch were seen at Legacy Marsh in upper Lantzville. Eight Western Sandpipers, one Killdeer, a Common Loon, and two Pigeon Guillemots were seen along the Plummer Road side of the Englishman River Estuary in Parksville. Eight American Goldfinch, four Pine Siskins, White-crowned Sparrows and three House Finch were seen visiting feeders in the 100 block of Meridian Way. Twenty Common Nighthawks were seen over Overlook Drive in Nanaimo. 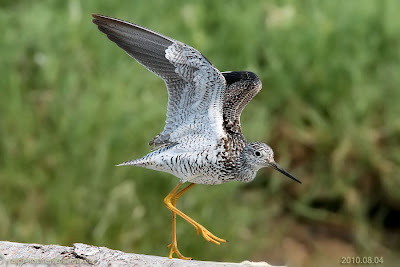 One Greater Yellowlegs, one Semipalmated Plover, Heermann's Gull and two Wilson's Phalarope were seen at French Creek. The Wilson's Phalaropes were swimming near the shore of the creek, came ashore to preen, then returned to the water to feed and shortly after flew out over the ocean. Over eighty Common Nighthawks were seen hawking insects over the 2500 block of Glenayr Drive in Nanaimo. 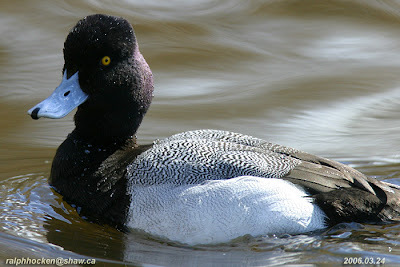 The Sunday Bird Walk on August 15, 2010 will be going to Linley Valley in Nanaimo. We will meet at The Backyard Bird Store at 9:00 A.M. or at the end of Burma Road off Lost Lake Road at about 9:20 A.M.
Semi-palmated Plover: Ralph Hocken Photo. The Sunday Bird Walk went to the Plummer Road side of the Englishman River in Parksville. The morning was cloudy at the beginning of the walk, but turned sunny as the morning progressed and the wind was calm. The highlights included seeing a Semipalmated Plover, Least Sandpipers, Western Sandpipers and a Greater Yellowlegs as well as over forty Killdeer on the mudflats. The Shorebird migration has begun! California Gulls, Bonaparte Gulls, a Ring-billed Gull, Glaucous-winged Gulls and Mew Gulls were on the sandbar on the Strait of Georgia, just off shore and three Common Loons were diving and swimming a little further off shore. Canada Goose, Mallard, Common Loon, Double-crested Cormorant, Great Blue Heron, Bald Eagle, Turkey Vulture, Killdeer,Semi-palmated Sandpiper Least Sandpiper, Western Sandpiper, Semi-palmated Plover, Greater Yellowlegs, California Gull, Bonaparte Gull, Ring-billed Gull, Glaucous-winged Gull, Mew Gull, Belted Kingfisher, Rufous Hummingbird, Northern Flicker, Northwestern Crow, Common Raven, Chestnut-backed Chickadee, Bushtit, Bewick's Wren, Willow Flycatcher, Western Tanager,Barn Swallow, Violet-green Swallow, Cedar Waxwing, American Robin, Swainson's Thrush, European Starling, Spotted Towhee, Chipping Sparrow, White-crowned Sparrow, Brewer's Blackbird, House Finch, and American Goldfinch. Twenty-four Bushtits, three Chestnut-backed Chickadee families, one male and two female Anna's and one female Rufous Hummingbirds, one Berwick Wren, one Red-breasted Nuthatch, one House Finch family, one White-crowned Sparrow, one Common Nighthawk and one American Robin have been visiting a backyard along Lancashire Avenue in Nanaimo. A family of three Barred Owls was spotted at the old school in Saltair. A flock of Red Crossbills was seen at Nanoose Bay. A pair of Merlin were seen along Bay Shore Drive in Nanaimo. Cedar Waxwings are feeding in a Mulberry Tree, along Benson View Road, opposite Witchcraft Lake in Nanaimo. The Sunday Bird Walk on August 08, 2010 will be going to the Legacy Marsh in upper Lantzville. 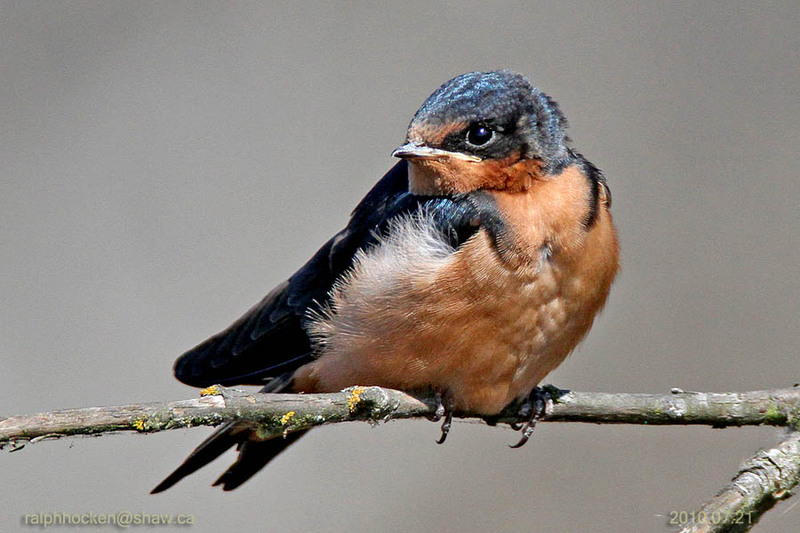 We will meet at The Backyard Bird Store at 9:00 A.M. or under the Hydro lines along Normarel Drive at about 9:20 A.M.